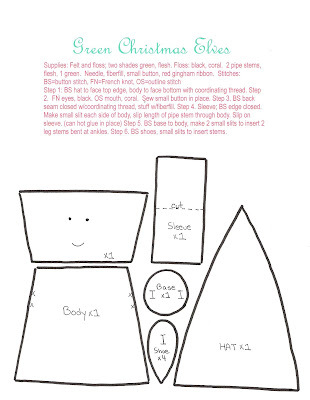 Do you ever pick up a craft book at the store, and even though clear instructions are given, wonder how on earth you could possibly make what your eyes are seeing. This was the case with Delight in the Details held in hand at JoAnn's for more than a year. I absolutely fell in love with the project entitled Candy Box Album Cover. This year I have enough learned skills to give the project a go. 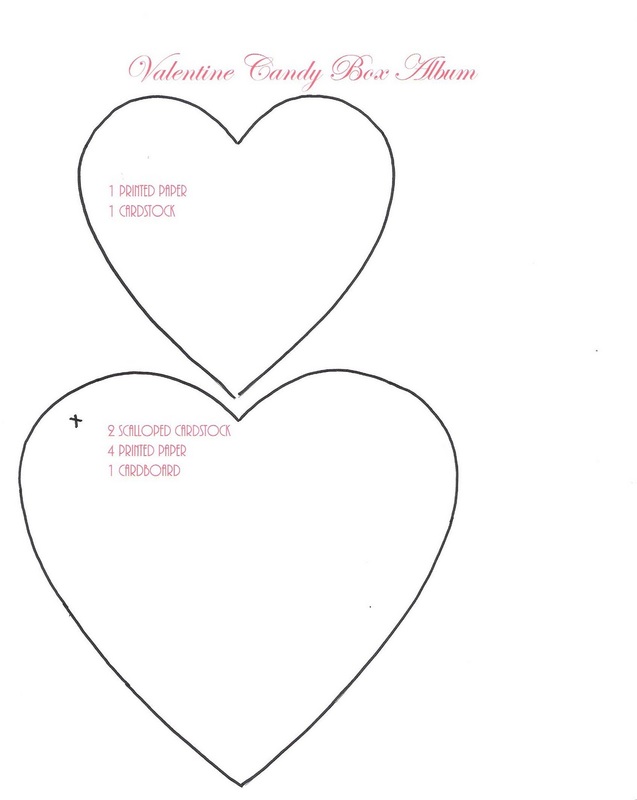 A heart cut from chipboard (a cereal box will do) is traced on the back side of card stock. Scallop cut around drawn line. Using chipboard heart as a pattern, cut a second heart from cardboard, a third from printed paper. Glue stick all layers together for a nice sturdy base. I call this the "Sandwich Method". Glue Sandwich to chipboard heart. Backside of album is covered with printed paper cut slightly larger than drawn line. Don't forget to punch hole with each sheet of paper added for jump ring. Spread thin layer of Tacky Glue with a few drops of water added to thin slightly to outer edge of first one half of heart including scallop, apply glitter, and then other half, apply glitter; set aside to dry. View Image, Print 8x10 sheet of paper, or Print Preview, choose Percentage right for you. PAPER CRAFT TIP: To create a smaller sized pattern of the original heart shape and maintain same shape, trace half of template onto folded paper, create smaller size needed by keeping pencil line same distance from original drawn line. Project: Cut from cardboard one small heart, cut one printed paper heart. Glue stick together. Six layers of alternating red and white crepe paper length of circumference of heart is sewn slightly off the center line of width of crepe. (You can sew again a scissors width away from first sewn line to be able to use both halves of crepe) Cut 1/8" slits up to sewn line length of crepe. BEFORE SEPARATING CUT CREPE hot glue sewn edge to edge of small heart. Separate crepe. Hot glue smaller heart to scalloped base. Cut (4) 3" strips of white satin ribbon 5/8" wide, 3" strips gold ribbon 1/4" wide, layer gold over white and staple ends together. Hot glue two ribbon pieces together twice to be placed underneath rosette created. Lightly twist length of 1 1/2" wide wired ribbon. Hot glue a first turn of the ribbon to create a center. (Back shown) Twisted ribbon is then circled around center, hot glue last turn underneath rosette created. Hot glue to ribbon loops, hot glue to crepe. Valentine's Day was the very first holiday I celebrated with my husband who gave me a heart shaped box of chocolates such as this. I slept with that box on my nightstand for months to come and kept small mementos of our dates together inside. In the days to follow I will be creating the pages of my album to recall the wonderful crafts I have made to celebrate Valentine's Day this year. On the first Sunday of my married life, my husband took me to meet his beloved Uncle Roy and Aunt Dorothy and their large brood of children and their childrens children after morning church. Dressed in my Wedding Going Away Dress, a shirt waist dress with a full skirt and raw silk shoes, the best impression wanting to be made. I wasn't at all prepared for the large group of people all related to each other and now to me dressed in their scruffiest of clothes. Aunt Dorthy enveloping me in her bosomy embrace greeted me, "Well you can't pick mushrooms in high heels!" I was quickly swooped away by daughter-in-law #1, hanging on to her reassurance that something easily could be found for me to wear. It didn't seem to occur to her she was at least a foot shorter than I was. "Here, these pants are stretchy and this sweater is from when I was last pregnant. I've got shoes someone gave to me around here somewhere that will just do the trick." It took all the courage I could muster to appear before the large crowd waiting to pick mushrooms in pants that didn't cover my calves, a sweater barely reaching my elbows, and red clodhopper shoes I can't imagine anyone ever having worn. I will forever recall this day as the one I learned mushrooms didn't just come from the grocery store and could be as wrinkly and as unattractive as could be and that a family would wait an entire year for just the right moment to descend up the floor of the forest in search of this elusive fungus. It was also the first day of my life to be embraced by a family I now call my own and who love me with all their hearts. My husband is an "Early to bed, Late to rise" type of person, I am a "Late to bed, Early to rise" type of person. I always lean over the bed to kiss him a last time after I have put on my slippery nightgown and before returning to my craft room for an evening of creativity. Searching for his lips in the glow of the television, I said, "I love that my blog and my crafts make so many people happy." To which he responded, "You love that you are happy." An "Egg before the Chicken" question that has me pondering. My blog is about crafts and stories. If I didn't have something to share, why would anyone visit. My first year of blogging was only about telling stories very few people read. My second year of blogging was about discovering my own creative voice. A few more came to see. This past year of blogging has been a true expression of my creative heart and words, many have responded so kindly. This is the year I want to remember always. On my sidebar you will see "E's" Craft Room Creations where I am putting together a book for myself to recall this most special year. So yes my husband's statement is correct. I love to blog and craft because it makes me happy. But like love, unless it is shared, it's value can never be truly known. I would not have this very special year if it were not for you! A Pooch Tut for You! It seems my Poodles in Paris were quite the success. A tutorial for you! I absolutely adore chenille stem animals because they remind me of my beloved Uncle Howard and the wonderful cherry pipe tobacco scent that always clung to him. A pipe stand by his chair, yellow envelopes of cleaners always missing one or two to shape into animals. POODLE: One stem is coiled around pen or pencil. The circumference of object determines how large your puppy will be. A second stem is inserted through coils made. Bend stem at right angle to form tail at one end, neck at the other end. A poodle has a long neck. A backwards "4" is made to create triangle shape base for head coil. Snip cleaner. "U" shaped lengths of stem are inserted between body coils. Trim legs to desired height. A third stem will be needed. A pen or pencil is used to form head. Wrap six coils towards point creating shape to taper. Insert "4" triangle inside coils from larger opening. Ouch! Stem inserted between head coil to form ears. Trim to desired length. Using small pointed scissors trim away cleaner from metal center at tip of each exposed stem. Insert stems into centers of med. poms for legs, smaller for ears and tail. Trim poms. Tacky glue is used to place eyes and trims. I usually use seed beads for the eyes. How cute are these canine companions! By changing small details, you can create different types of dogs. I have bent a second stem and twisted it to create a thicker tail. A shorter neck, a backwards "4". Flattening the head coils creates a different shape for this puppy. Thicker legs created by twisting bent stem first. Or by coiling around leg another stem. I use a candy stick to create these small coils. Short dogs with long legs, wide dogs with short legs. Ears up, ears down, whiskers or pug nosed. I promise once you make one, you will make another. I now have used my entire supply of pink pipe cleaners making Valentine Pooches! Speaking of Valentines and pooches, my Twirly Swirly Girl had her First Anniversary dinner table beautifully set waiting Joes return from work. A vase of flowers, petals on the table and floor, candles lit to create a scene. Nahla and Joe's puppy Elan ate all of the petals! Not to worry. Joe arrived with a bouquet of roses and bag full of petals of his own! Today is the one month anniversary for TSG and Joe. He bought the pot roast, she is going over to cook for him. The Big White Puppy is celebrating her one month anniversary with Joe as well. Joe also has a Big Puppy, and they have become the best of friends. Mom and Dad are enjoying being Home Alone, together. I made the ultimate mother mistake the other evening when Joe came by to end his evening seeing Kellye after a day of skiing. It was my first time meeting The One. Polite introductions made I sequestered myself in the family room leaving them the privacy of the living room. A drink of water needed, accidental eye contact made, Joe sitting very close to Kellye, embarrassed mother tries to cover up awkward pause. "So what exactly is it you do for the power company, Joe?" "Chemical Engineering?" "Oh, I know what that is. It's like when someone wants to make pudding but on a really big scale, you would tell them chemically how to do this!" "No?" "Oh!" "Reusable energy?" "How interesting!" Even without my glasses on I can see TSG glaring at me over Joe's shoulder. A polite retreat is quickly made. Happily crafting away on my cute as can be Valentine shakers, my daughter leans into my crafting room as she readies herself for her First Anniversary, "Mom, Joe says he felt a little embarrassed when you came into the living room." Indignant, defensive, embarrassed, mortified. "How can I possibly ever meet him again?" to which my daughter responded as she hugged me from behind and kissed me on the cheek. "Oh Mom, You're so dramatic, but I love you anyway!" Every memory of my own husband coming to see me at my parents house when we were dating seemed to flood my heart. I don't think I allowed them out of their bedroom! They are all done, Valentine hearts for you! What an absolute joy to create each and every one. I can't wait to address them and send them on their way. It was such fun to choose just the right Valentine for each person. A heart filled with romance is just right for Diane of Saturday Finds. 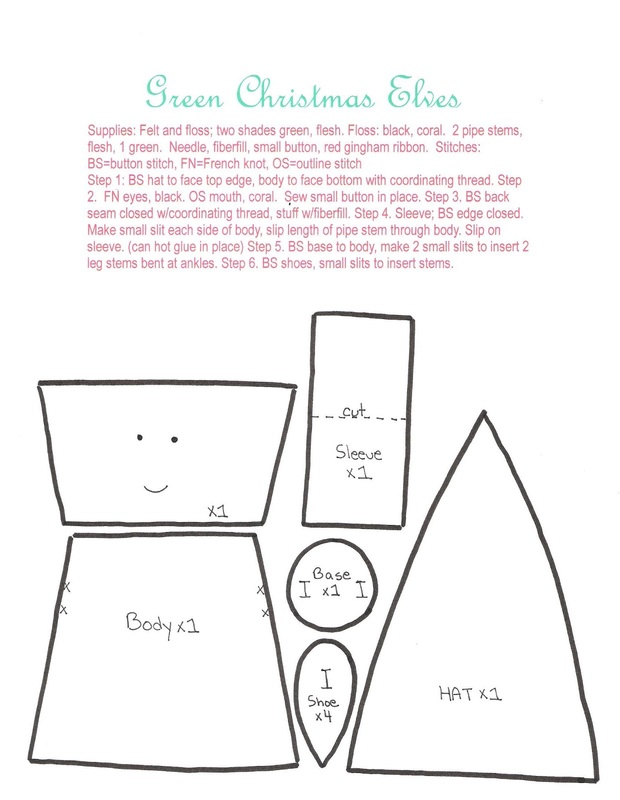 This young Miss is for Lindsey of Two Crazy Crafters. "How much...?" That's what Deb of Garage Sale Gal loves to hear her customers ask. A wise owl for a wise woman. Meri, of ImagiMeri. I hope you have been inspired by the wonderful images of another time and perhaps have recalled a special day of Valentines of your own.